Printed by Will Rueter at the Aliquando Press in 2014. 1 of 125 copies. 15" x 10 1/2". Printed on Hahnemuble white mould paper in Garamond, ATF Baskerville and XIV Century Roman. 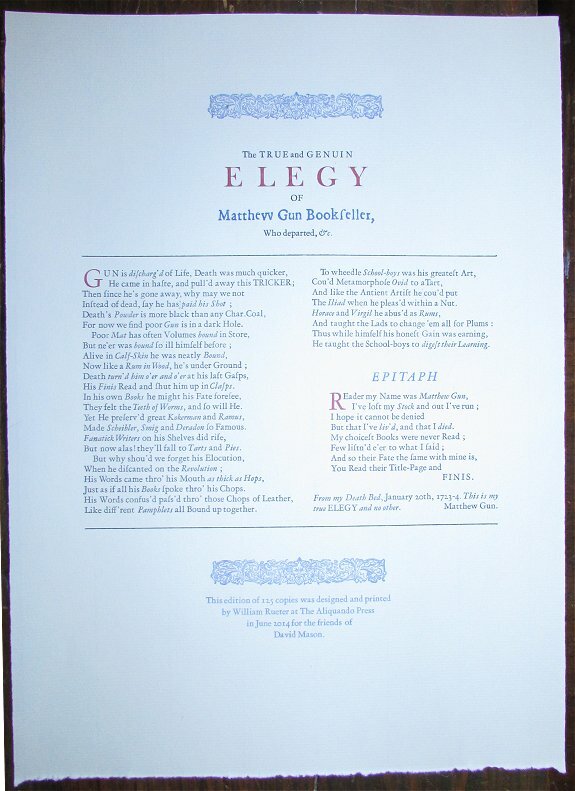 This is a reprint of an early 18th-century broadside. The original is held by the British Library and we have been unable to locate another copy. We felt this reprint to be a timely one given the precarious state of the book trade these days; Gun's lament resonates strongly. A fine work by one of Canada's foremost designers and private printers.